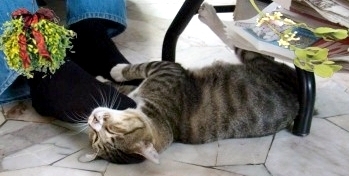 Katz And Other Tales: Wishing You A Furry Purry Christmas! Looking for a last-minute Christmas present? Check out Blackmail Bride, a tale of passion and mystery set in Scotland. Price RM7.56/US$2.32. Instant delivery, no post charges. 10% goes to Friends Furry Farm, a no kill animal shelter. Is that hat made out of butter???!!! It looks tasty! MOL! You look so elegant in your hat my friend!! We all have blessings, each and every day...one of mine is blogging and visiting with you...May your Christmas be Merry and your New Year bright! 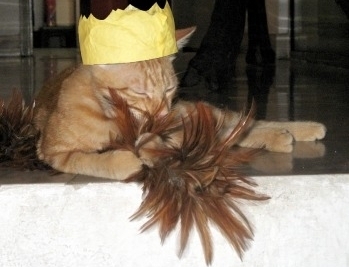 Merry Christmas to you too :O) Love the pictures, great hat and that feathery thing looks such fun! A very merry Christmas to you all. purrrr.....meow! Great pictures.... And Merry Christmas to all of you too. Here's wishing all of you a very blessed Christmas! Merry Christmas! Love the pictures!! p.s. I would love one of those foot massages! Mommy is hoping Santa will bring her one of those foot massages... sounds sooooooo good! 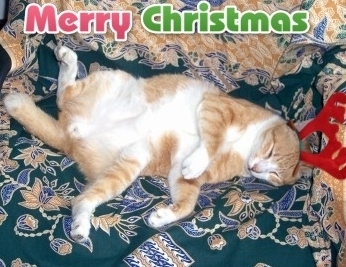 It's prolly Boxing Day already by you; we hope you kitties had a very Merry Christmas! How do christians celebrate in a predominately muslim country? Mommy is curious. Pee Ess: we LOVED the Scoop story! What awesome photos! And what a lovely time everyone had! I'll bet finding a home with you is the best Christmas present ever for Boris the Bear! Did you really put the hats on them or was it all photoshopped?